2014 Geneva Motor Show uncovered the most powerful SEAT Leon CUPRA 2014. Well not only a powerful engine is what Leon is bringing for its customers some extra features to ease their riding experience and also improve the car’s performance. Let us not delay much and see what they have for Leon 2014 model year. Interior of SEAT Leon CUPRA 2014 is unique amalgamation of style and quality. First to come across your eyes is a flat bottomed multi function steering wheel with required padding and grip for a firm drive. Just behind it are shift paddles, if you opt for DSG transmission (which comes as an option). Sports seats are covered in dark grey Alcantara with white stitching adding to their look however an option to go for black upholstery is also available with same white stitching. More in the list of option are bucket seats, if you want to add sporty look inside your SEAT Leon CUPRA 2014. IN all for us the entire SEAT Leon CUPRA 2014 dual tone interior is remarkable in its class. 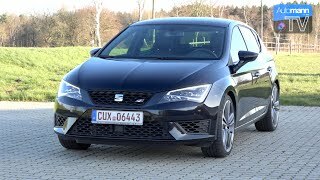 There are a numerous powerful elements in front and rear fascia combine together to create the decent and powerful exterior of SEAT Leon CUPRA 2014. Starting with the front end, large air intakes are encapsulated to deliver fresh air to engine and brakes. Adding to the sporty touch is a honeycomb mesh pattern grille amidst LED headlamps. 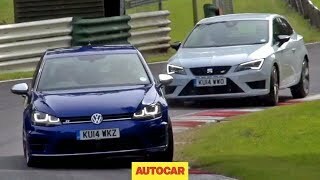 Moving towards the rear fascia of SEAT Leon CUPRA 2014 major sight of attraction come through, all new bumper, which incorporate oval shaped double exhaust pipes. This feature adds a little bit of visual width to the model and subsequently bringing bit of aggression at the rear end. Adding more to the aggression section are 19” titanium bicolor paint finish wheels. 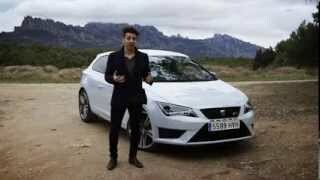 In all to us entire exterior of SEAT Leon CUPRA 2014 is remarkable combination of elegance and sporty touch. 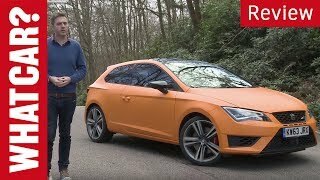 SEAT Leon CUPRA 2014 gets its power through a 2.0 Liter TSI Four-Cylinder engine which delivers total output of 280 hp and peak torque of 350 nm paired to six-speed manual transmission as standard. However an option to switch for Six-Speed DSG is also available with paddle shifters residing behind the steering wheel. Engine with its output is capable of taking you to a top speed of 155 mph (electronically limited) with 0-62 mph sprint to finish in 5.8 seconds with manual transmission.